The Siberian Husky is a breed that is not too well known in our country at the moment. This is understandable because in origin it is a sled-dog breed, used as such in the early days in the Polar Regions. Sled-dog races are held in North America, and specifically in Alaska, which are followed with great interest in the region. Amongst the many charming aspects of this breed are their independent spirit and the vast diversity in markings and colour, which still makes each one of them a beautiful specimen of the breed. We are very pleased to inform you in this Christmas Issue of the Hondenwereld about our Siberian Husky Kennels. 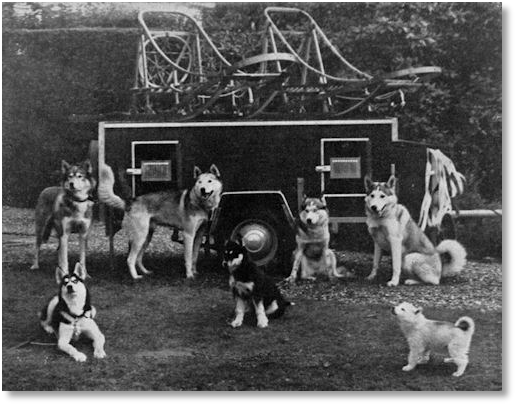 The picture shows you our first dogs we imported directly from Alaska from the well known Alaskan Kennels in Anchorage. Several of these dogs were running in the teams which participated with success in races in Anchorage. We hope that we will be able to develop a good breeding program with the dogs available to us, and we aim to preserve the “show” and “workability” aspects of the breed. Apart from the joy purebred dog owners derive from having their dogs judged in dog shows, the opportunity exists for owners of the different sled-dog breeds to enjoy “wintersport” with them. Each year in January, the opportunity is there to participate in a sled-dog camp in Switzerland, organised by the “Schweitzerische Klub Für Nordische Hunde”. We intend to participate in January with our dogs at the sled-dog races organised there and we are convinced it will be a wonderful experience for our dogs and ourselves. in the Christmas issue of the Dutch De Hondenwereld magazine in 1968. Our first dog box, our first Moody sleds and the first Dutch Anadyr dogs. Many sleds and many Anadyr dogs would follow. From left to right, top: Alaskans... Ch. Sha Luk King (Red), Malcheck, Chatka & Nanook of Anadyr. From left to right, below: Alaskans... Arnak, Ch. Sascha (Blackey) & Mishonak (Whitey) of Anadyr.